The ideal concentrated solution for all cleaning applications. Non-toxic, biodegradable, and non-flammable. So versatile it can be used anywhere on just about everything! Floor cleaning degreasers are perfect for routine cleaning jobs because they cut right through the grease and grime, leaving all surfaces sparkling clean. Leaves behind a fresh clean scent. Mix 2 ounces of solution per 1 gallon of water, for those average scrubbing jobs. 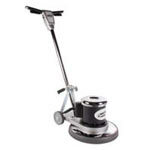 For more aggressive degreasers, take a look at our complete line of floor cleaning degreasers. For other cleaners that are not so aggressive take a look at our floor cleaning soaps. Great for use with our low speed buffers on those medium soiled jobs.